Over the weekend I noticed an interesting new display hanging in Hviezdoslavovo Namestie entitled Italian Architects and Slovakia, which shows enlarged photos of various buildings in Bratislava and the rest of the country that were designed by Italians. Among these are photos of several architectural models and illustrations from the early 1940s of plans to destroy Bratislava's centuries old castle and replace it with a university campus. That's right. In 1940-41, Bratislava's city planners sought to demolish the city's castle and in its place build a large, modern technical university campus. 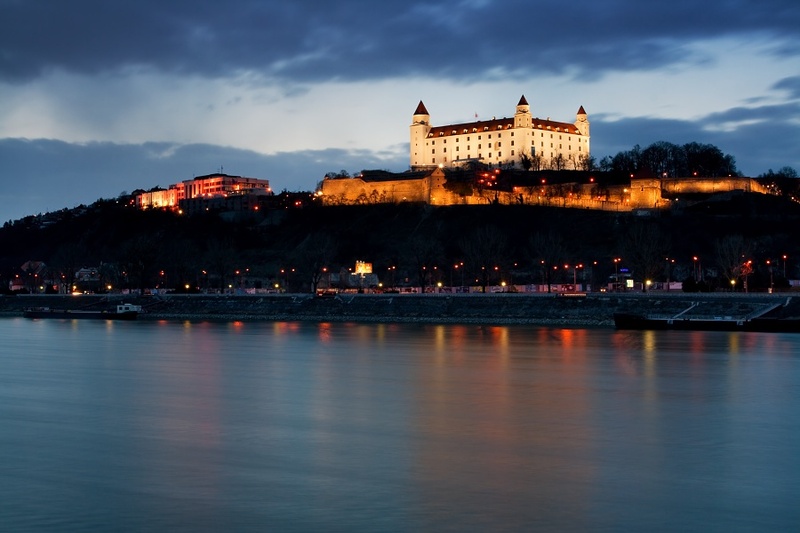 Of course, the castle just so happens to be one of Bratislava's most significant historical landmarks, not to mention one of the key defining features of its skyline, perched as it is atop a hill dramatically overlooking the Danube. 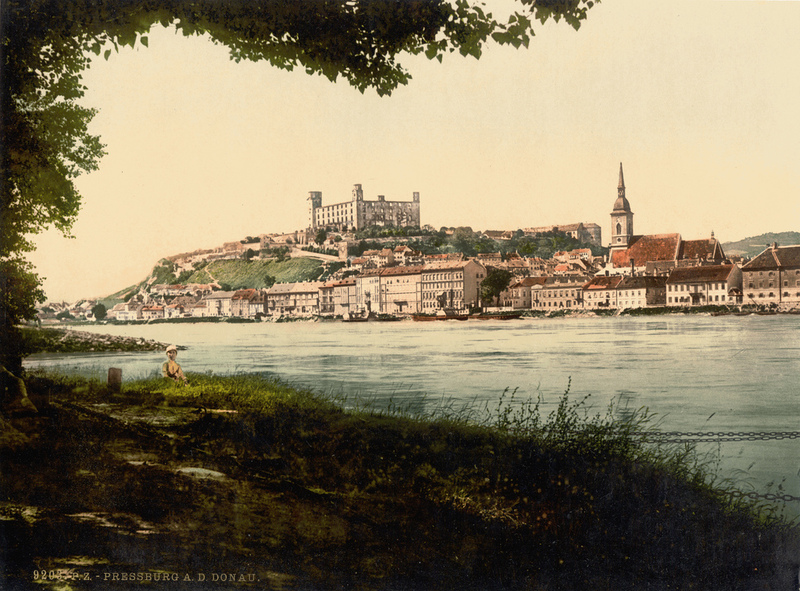 View of Bratislava's castle and historical town from across the Danube, as depicted on an old postcard. It would seem that knocking it down was not something to be taken lightly. Yet, in the late 1930s, the city wanted to do just that, and a competition was held wherein architects from around Europe created and submitted their designs for the project. 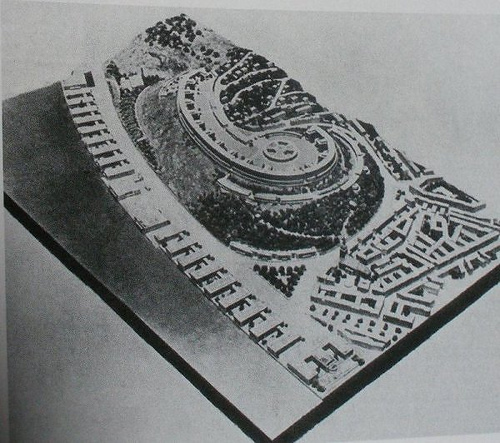 Entries were narrowed down to the plans of a few Italian architects, and had the city gone through with either of their designs, Bratislava would look quite different today, as these photos below illustrate. This plan, by Italian architects Aldo Lucchini and Giuseppe Pasqui, actually appears to keep and possibly restore the castle. But notice how, curiously, the two eastern towers are gone and only the two western towers remain. (Click photo to enlarge). This plan, designed by Ernesto and Attilio La Padula, does away with the castle completely, but preserves the southwestern tower, which is the oldest and largest of the four towers. The above design seen from a different angle. Similar view as above, but with the castle. How the above design would have looked from across the river. I have no idea who designed this and when. This is not part of the photo display in Hviezdoslavovo Namestie - I found it on-line, but cannot find any information about it. Perhaps this was designed by a local? I'm guessing it dates from the same period as the above designs. Regardless, it's pretty ghastly. Fortunately, for whatever reason (I'm not totally clear if it was the war, a lack of money, or combination of the two), these plans were never executed, and the castle was spared. But hold on - do you notice something else? Something missing from these designs? In all of these plans, not only has the castle been altered or demolished, but the entire area around the base of the castle hill, including the Jewish neighborhood (and old Jewish cemetery), has also been demolished and completely redeveloped. Tellingly, the only thing along the side of the hill that any of the designs left intact is the small catholic church of St. Nicholas, yet the historic neolog and orthodox synagogues are nowhere to be found! 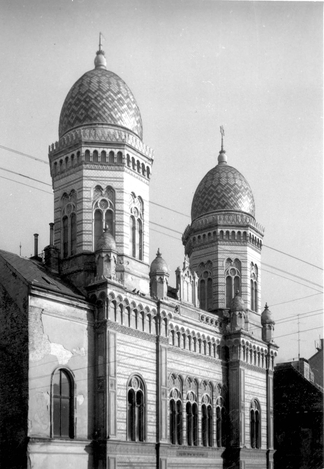 This indicates that as early as 1940-41, shortly after Slovakia became a Nazi-puppet regime, but before it embarked on its program to deport all of its Jews (which began in March, 1942), the city already had plans to completely demolish the Jewish quarter. I have to assume that this is what the architects were commissioned to do, that they were told the entire hill was fair game. And this raises a couple of questions: how long had city planners been wanting to bulldoze the Jewish quarter, and was their plan influenced by the wave of anti-semitism that hit Slovakia around this time? Fascist leader Josef Tiso came to power in early 1939 and began enacting his anti-semitic policies that same year. If it was in this atmosphere that these designs were commissioned, none of this should come as a surprise, and these designs can perhaps be seen as part of a much larger and more disturbing plan. The photo display in Hviezdoslavovo Namestie completely glosses over this point, and the brief descriptions focus merely on the Italian architects and the designs they came up with. But surely, if in 1941 anyone was unaware that Jews would soon be deported, seeing these plans would show that the writing was definitely on the wall. What's implicit in these designs is therefore quite chilling. Of course the Communists would eventually be the ones to plow through much of the Jewish quarter in the 1960s, but that's covered in another post. As for the castle, well, as strange as it sounds, there was a time when demolishing it probably seemed like a logical thing to do. We have to take into account the fact that in 1811, the castle caught on fire and the resulting inferno left it a burnt, hollowed-out husk. Only the exterior walls remained intact; the interior was literally reduced to rubble. The castle remained in this ruinous state for nearly 150 years. By 1940, I imagine many people felt the damage to the castle was far too extensive to even contemplate restoring it. When seen in photos, the ruins look daunting, and I'm sure some people felt it was nothing more than a structurally hazardous eyesore sitting on a prime piece of real-estate that could be better used for something else. The castle in the ruinous, hollowed-out state in which it remained after its 1811 fire for nearly 150 years. The castle's severely damaged post-fire interior. (Click here to see a cool illustrated history of the castle, documenting its life from its medieval roots, through the fire and resultant destruction, to its reconstruction and present state). But wait, wasn't there anyone who cared at all for the castle and its historical importance to the city? Was there anyone who opposed its destruction and lobbied for its restoration? I don't know if the Communists - when they came to power in 1948 - initially intended to use either of the Italians' designs, or if they had something else in mind, but in 1953, Slovak artist Janko Alexy and Czech architect Alfred Piffl somehow managed to convince the regime to reconstruct the castle instead of destroying it to build the university. I have no idea how the hell these guys got the Communists to agree to this. I mean, A. it was an enormously costly undertaking and the Communists were perpetually short of funds, and B. the Communists were generally hostile towards architecture (or anything, really) that conflicted with their ideology, and were extremely reluctant to repair or restore it unless it had some legitimate, functional use. To them, the castle recalled a feudalist past, something that they clearly did not want to promote or advocate in any way. Yet, somehow, Alexy and Piffl sweet-talked them into a full-scale restoration. That they did is nothing short of miraculous. Not surprisingly, the restoration took 15 years. As thorough as the reconstruction was, however, they cut quite a few corners, and it wasn't until shortly after the year 2000 that the castle underwent an extensive restoration that brought it back to its former Habsburg-era glory. Of course, what you see today is almost entirely a replica, but at least it's there as a symbol of Bratislava's rich history. But let's be honest - visually, it's not the most fetching castle by any means (it's kind of a boxy, hulking white monolith; the towers on its four corners make it resemble an upside down table). However, it's still a fascinating place, and there's definitely something majestic about the way it's perched at the top of the hill. And furthermore, it's a significant piece of Bratislava's history that I think most of us can agree was worth preserving.